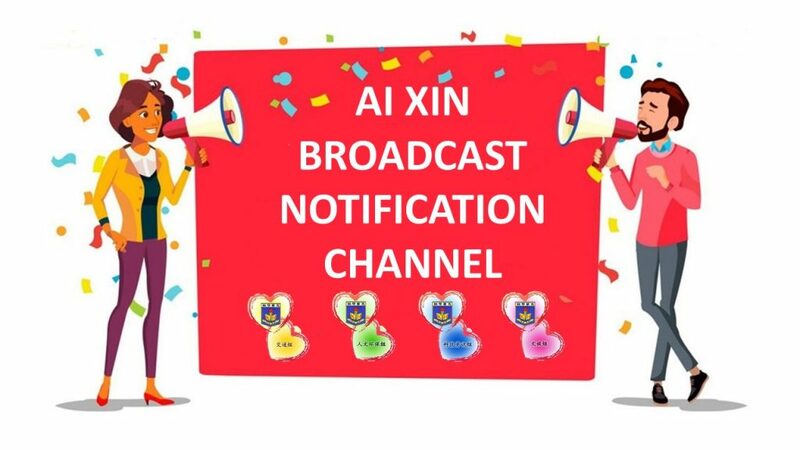 To enable timely notification to parents or guardians, a new Broadcast Notification Channel using WhatsApp platform is now launched. Please read Terms & Conditions and FAQ below. By subscribing to this service, which is maintained by the “Provider” as defined below, you will be deemed to have accepted these terms and conditions. The Provider reserves the right to change these terms and conditions at any time without prior notice. In the event that any changes are made, the revised terms and conditions shall be made available to Subscriber immediately at the Website. Please check the latest information posted in the Website to inform yourself of any changes. 1.a. “Service”: A voluntarily subscription in order to receive one-way messaging content from the Provider through a determined Communication Platform. 1.b. “Content”: Information about the traffic & safety control measure for the School or any other information that is deemed relevant by the Provider. 1.c. “Provider”: Aixin Parent Group of Parent & Teacher Association, PTA or translated in Malay as Persatuan IbuBapa & Guru-Guru, PIBG of the School. 1.d. “Subscriber”: You, who submitted this subscription form and must be a member of PIBG of the School (All parent or legal guardian of student in the School are the member of PIBG of the School). 1.e. “Communication Platform”: WhatsApp Messenger, a freeware and cross-platform messaging application and the mobile phone number associated with the application in order to enable the Service. 1.f. “School”: SJKC Kwang Hwa Sungai Nibong, Pulau Pinang. 2.a. The Service is solely used as one-way communication from the Provider to the Subscriber and therefore, the Provider has no obligation to or will not answer, reply, response or entertain any call, text or any other form of contents that deliver to the Provider through the defined Communication Platform or any other means of communication. 3.a. The Provider reserves the right to terminate the Service, solely at its own discretion and at any time, without prior notice. 3.b. The Provider reserves the right to remove anyone from its subscription list, solely at it’s own discretion and at any time, without prior notice. 3.c.i: Remove the associated mobile phone number from the Subscriber’s contact list, which ends the subscription immediately. 3.c.ii: Submit termination form at the School’s website, which the Provider will no guarantee of timely unsubscription. 5.a. All the content provided through the Service is provided on best-effort basis by the Provider and you agree that you use such information entirely at your own risk. 5.b. Under no circumstances will the Provider & the School be held responsible or liable in any way for any claims, damages, losses, expenses, costs or liabilities whatsoever (including, without limitation, any direct or indirect damages for loss of profits, interruption or loss of information) resulting or arising directly or indirectly from your use of or inability to use this service or from your reliance on the information and material from the Service, even if the Provider and the School have been advised of the possibility of such damages in advance. 1. What is this subscription all about? Ans: A subscription to receive one-way messaging content from PIBG of SJKC Kwang Hwa Sungai Nibong Pulau Pinang. 2. What content will be broadcast in this subscription? Ans: Information about the traffic & safety control measure for the School, Aixin related activity or any other information that is deemed relevant. 3. Who is maintaining this subscription list and content? Ans: PIBG of SJKC Kwang Hwa Sungai Nibong Pulau Pinang. 4. Is it compulsory for parent to subscribe to this subscription? Ans: No, the subscription is 100% voluntary. Non-subscribers can still access the same info via PIBG/School Facebook account or school website. 5. Since the information is available on PIBG or School Facebook, then what is the purpose of this subscription? Ans: The service provides an instant and convenient way to “push” content/info directly to subscriber’s hand phone. 6. Why WhatsApp is choosen instead of other apps? Ans: As per MCMC (Malaysian Communications & Multimedia Commission) Internet Users Survey 2018, WhatsApp is the most popular communication platform in Malaysia. 7. Can I call, text or sms to the subcribed phone number? Ans: No, this is only one-way communication. No call, text or sms will be entertained. 8. How will the information provided in the subscription form be used? Ans: As described in the Terms & Conditions, all the info collected will be solely used for the subscription & future service maintenance purpose. 9. How can I un-subscribe to the service? Ans: The easiest & most efficient way is by removing the provider’s phone number from your contact list. Otherwise, you may fill up this unsubscription form. 10. Since it’s one-way communication, who should I contact if I’d like to provide feedback about the system? Ans: Email to [email protected] or please contact the school.